You’ll find a pleasant place for lodging near Kennesaw, Georgia — a bustling college town with a stellar hospital. 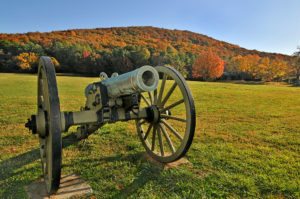 Tom Wilson’s photo of Kennesaw Mountain National Battlefield Park in the City of Kennesaw. Also nearby is Kennesaw Mountain National Battlefield Park (KMNBP), a 3000-acre park where an 1864 Civil War battleground is preserved. Don’t let Tom Wilson’s photo of that cannon scare you. It’s probably not aimed at where you will be staying. Besides, cannon balls probably don’t go very far. You won’t be in any danger at all. Probably. The listed hotels offer a range of prices, locations, and types of rooms/suites. We offer this service as a courtesy, but we make no guarantees pertaining to your private transactions for accommodations with any of these sources. The City of Kennesaw is a great place to be — whether you want to drive south into Gotham City or saunter over to Lake Allatoona.